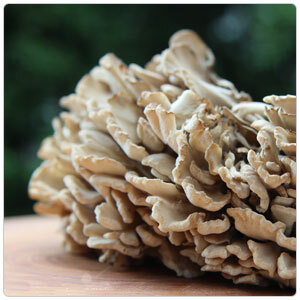 Maitake mushrooms, also known as Hen of the Woods, are clusters of small, fan-shaped caps. The caps are ruffled and are often a grayish-brown color, sometimes tan. The undersides have pores instead of gills. The flesh is firm and contains L-glutamate, a natural flavor-enhancer that provides umami -- the "fifth taste" -- the savory rich flavor that excites receptor-specific nodes on your tongue. Maitake mushrooms can be roasted, sautéed, and grilled to be used in appetizers, pastas, pizzas, as a vegetable component, or a side dish. Simply serve with good olive oil and salt, salsa verde, spicy mayonnaise, or lemon and parsley. Maitakes are native to Japan and North America. They have been known to grow up to 50 pounds, which is where they get the moniker "The King of Mushrooms." Long used in Oriental medicine as an immune booster, modern research has proven that maitake mushrooms have cancer-fighting properties.